I have known Ed for a number of years, first liaising with him when he appeared in our reader's showcase feature a few years back. We have stayed in contact ever since and Ed is also keen to share his latest pieces with us, which are always a joy to see. Over the years I have witnessed his work develop and the embellished and sculptural turnings he is now producing are simply stunning, incorporating a variety of mixed media and textured surfaces. Despite being familiar with his work, I realised I didn't know much about Ed's background or how he discovered turning, so I decided to start from the beginning. Ed tells me that he graduated from the University of Notre Dame in 1991 with a degree in management and also design. While he was in school, he was very interested in photography, which he had been enjoying since high school. In his many hours spent in the art building, Ed had access to the sculpture studios which included the wood shop. 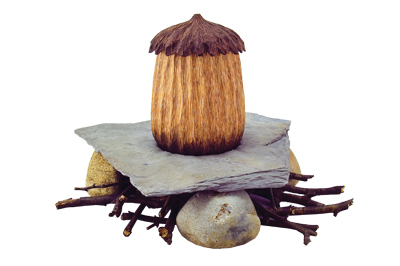 Though he states that he does not recall there being a lathe present, he may have never noticed it: "I did learn to use all the standard furniture making tools and created my first few sculptures. After graduation, I decided to pursue a career in painting. This lasted about five years. My paintings were definitely non traditional, as they were in the separate styles of abstract expressionism and also cave paintings," he explains. Ed goes on to tell me that in the late 1990s, he decided that for financial reasons, he needed to enter the field of graphic design, so he bought an Apple Mac computer along with the programs and went about learning them on his own. He was employed in the toy industry creating packaging design for approximately six years until he felt a strong desire to work with his hands: â"I had been reading woodworking magazines during my commute and once again read everything I could and set about to pursue a different direction with furniture creation. Unfortunately, I become frustrated by my inability to create perfect right angles due to my equipment," he tells me, but all was about to change. Ed tells me that it was during these struggling times that he attended a woodworking show and witnessed a bowl being turned: "I could not take my eyes off the shavings flowing from the gouge. It was simple, quick and beautiful. 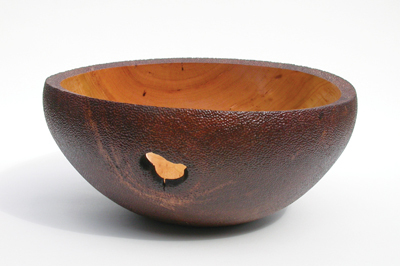 Right after that show, I bought my first lathe and changed my focus to woodturning." In terms of the work and style he produces, Ed explains that initially his style was more of the traditional turnings: hollow forms, bowls, pens, wine stoppers, etc. He says that it was only through a small mishap that his style evolved: "I had done a nice small bowl, and preparing to oil it when I noticed a nick on the rim. As I did not have a method of remounting it to re-turn this, I looked for a way to hide this. After looking around my shop, I noticed my Dremel tool and decided to dimple the entire rim of the bowl using one of the burrs in the kit. With the wood being cherry (Prunus spp. ), of course it did create burn marks from the burr, so then I stained the rim as well. Of course this led to further rim treatments on bowls, and finally to dimpling the entire outside of a large cherry bowl that had an open knothole. That piece took approximately eight hours, and my hands were killing me." From this point, Ed decided to purchase a flexshaft attachment, and his life was made much less painful. Over the course of development, he begin to go deeper with his textures; first scalloping the outside of pieces with sanding belts before texturing. Then he encountered the unexpected wormholes and live worms in some wood he was given: "In the course of 'Dremeling' out those little critters, I began to carve deeper and deeper, and even pierce through the wood entirely. That was when I really started to create much of the style I do now. Texture has played a large role in my works, and that related back to my interest in macro photography, all based around the old saying that 'God is in the details'. I put lots of details into my pieces, though they are quite organic and abstract. I never try and replicate nature at all, but rather do a more impressionistic representation of it. What has been called my coral style, is really nothing like any coral I have seen yet it does make one think of coral." Ed tells me that he has also started becoming more sculptural with his works as well and utilising various other materials. He comments that his painting studio is still stocked with supplies so works from the last few years have incorporated colours into them as well as various acrylic textures. Ed had already given me a big insight into the sources he looks to for gaining inspiration, but I wanted to delve deeper. 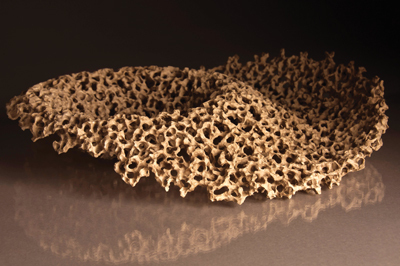 The mention of wanting to recreate the texture of coral made me realise that nature itself is at the heart of Ed's pieces, but he tells me that with some of his works, he wants to invoke the idea that this could possibly be a piece that exists in nature, not made by man: "The series of blossom forms I have made are inspired by nature. The closer and closer you look at nature, the more amazing things you see. I strive to create pieces that make a viewer want to take a closer look at them and even touch them. The sense of touch is often lost in woodturning. There is the feeling that glossy items are off limits to touching and fragile pieces even more off limits. The textures I create beg to be touched and examined for all their details." From hearing about the evolution of his turning style and preferences, it is clear that Ed's focus has certainly shifted from creating the utilitarian items he once produced to the textured and sculptural pieces he now gravitates towards. He clarifies that he is now more openminded to possibilities and no longer limits himself. Ed explains that over the past three years, he has definitely re-opened his eyes to all the fine arts: "I was always very fond of reading art history so I do have a good knowledge of works done in the various eras. During my beginning years of woodturning, I was focused on traditional works but now I have begun to release myself of those constrictions and understand that the lathe is only one of many tools at my disposal. 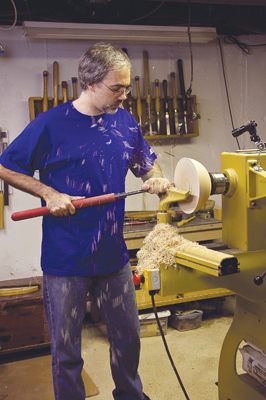 These days, only a fraction of my time is spent on the lathe and I am OK with this." He also says that he has been fortunate enough to participate in the past two Echo Lake collaborations, begun by Mark Sfirri, and these events have furthered Ed's interests in incorporating other mediums into his work. In terms of summing up his style, I, personally would edge towards the words â'contemporary' and 'artistic', but I decided to ask Ed for his take on things: "I would describe my style as an impressionistic representation of nature, somewhat sculptural, and inviting of introspection. The works can be taken in either of two ways: one is a quick glance and overall impression of what it is; the other can be a closer and more focused examination of all areas of the piece, allowing the viewer to lose themselves for a while in all the details. Which makes sense to me because during the many hours of creating that they take, that is what happens to me. It is almost a meditative state that the process creates in me, and this happens not in one sitting but over the course of however many days." In terms of other turners who Ed admires he cites the great Richard Raffan and John Jordan. Ed explains that he first learned to turn thanks to Richard's books and videos. Of course there was a lot of running up and down the stairs going from video down to the workshop and trying to remember what he did, and did so quickly and effortlessly, in Ed's opinion: "Richard produces such wonderful forms. No matter what I may do to a piece as far as texture or surface treatment, it must always have good form first. I love the round bottom bowls and pots Richard creates. 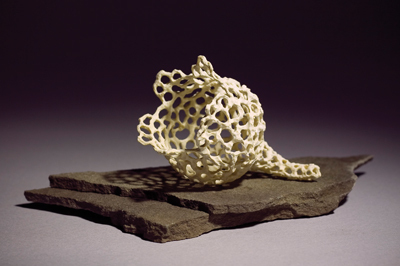 John's works also have perfect forms and for me, they create a sense of peaceful tranquility. While I was learning to turn thanks to their videos, I never once imagined I'd be able to call them my friends, as I am proud to do so now.â€ On the artistic side, he is inspired by the sculptures of Constantine Brancusi and Henry Moore, while the painters Mark Rothko and Jackson Pollock are some of Ed's favourites. I was already lucky enough to have a sneak peak at Ed's workshop, thanks to the feature a few years back, but I was keen to see how this had changed over the years. Ed explains that he has a few different areas in his workshop: "The lathe area contains my Powermatic 3520 as well as a Jet 1410. I had started out with a Delta lathe which gave me nothing but problems for over a year. While I was able to turn with it, for bowl work, the single bearing on the spindle created too much vibration and I could never get a clean cut. Even after replacing the bearing and getting an entirely new headstock. I was about ready to give up when I bought the mini and it made a world of difference. This led to me creating some textured works that I brought to my first national symposium in Louisville, Kentucky where I was selected for the instant gallery critique. With that accomplishment in my mind, I bought the Powermatic at the show and continued my career as a turner. All thanks to a mini lathe. Other areas of the shop are the workbench area, where I spend many hours with my power carvers, my painting area, and my photography area." Ed tells me that with his works, no matter what the medium, he has always developed his own style. It is not a matter of being different just to be different, but rather doing something that feels right to him: "I see lots of works with techniques that I really like, but would not do because they are not mine. For instance wood burning, I see lots of great work being done with wood burning, but that is not something I see myself taking beyond what is being done already. On another note, I have never been afraid to fail nor afraid to produce work that might not be praised by everyone. It is just part of being an artist; you have to push yourself in new directions and take chances. That sure does make life more interesting," he says. Ed also tells me that sometimes, he doesn't even finish a piece if he realises that it has served its purpose in teaching him something or inspiring another idea. Either way, Ed always strives to do the best he can with each piece he produces. He reiterates that this also carries right through to the final photography of the work: "The viewers should be able to understand the piece from just one photograph, and with many of my latest pieces being more air than wood, this is often a challenge. With today's technology, we have been overwhelmed by the sheer volume of images each day, so producing a powerful image is key to what I do." When taking a closer look at some of his pieces, it became clear to me the sheer amount of work that must go into texturing and stippling the various components that make up one of his turnings, so I was interested in the length of time it takes to create this. Ed tells me that it can vary from a few hours to over 60 hours depending on the size of the work. Ed explains that there really are no shortcuts for doing detailed work where the whole piece is thinned out to the same levels before going thinner and thinner: "I've made 180mm pieces that weigh under 1oz. It all takes time and I can only work a few hours a day before I have to stop. So the process is stretched out over a few days or weeks." In terms of the high and low points of his career to date, Ed is quick to focus on the positives and explains that there have been many highs so far, including getting his works published in magazines and having pieces selected at critiques. Ed recently received an AAW Excellence award the first year they began them, which unsurprisingly was a big high: "Most of the highs have been related to symposiums I have attended and all the nice things people say about me and my works. Having people buy my works is always a high. Of course the lows are necessary because without them there are no highs, but I never let them get me too down. Mostly those are the times when I have not sold a piece in a while. I recently broke a piece I was working on after about 15 hours but did not let it get me down as I was not totally sure about whether the piece would work; it was a base for another piece. In the end, I believe it was all for the best as what I did after worked much better. Failure is not always the worst thing to happen, it can be a necessary step to lead in a better direction" he wisely says. So what is the best thing about turning? In Ed's opinion this is an easy question to answer and for him, this is the friends he has made. Without a doubt. He tells me that when he was in the design field, there was just work and not much else, but since he has been turning, he has had the opportunity to meet so many wonderful people: "Thanks to the internet, I have even become friends with people around the world. It is absolutely amazing, and still I have a hard time believing it. To me it has become quite normal to have friends all over, but when I talk to others, it seems like such a foreign concept, which is exactly what I would have thought many years ago.â€ Ed explains that turning has enabled him to travel to places he would never have gone and meet some fantastic people. â€œI will always say, the most important thing I have made as a woodturner is friendships," he reiterates. So where does Ed see himself heading? 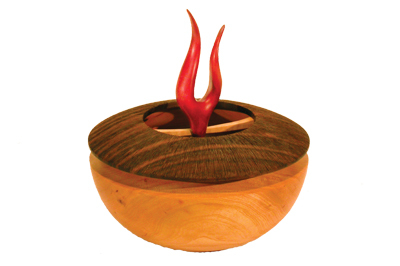 He comments that he has recently started to become more interested in writing and photography of woodturning and wood art in general, so he is pursuing these avenues as well. He tells me that he will continue to produce his works and demonstrate his techniques, as teaching really lifts his spirits: "I love to share all that I know and hear the excitement in others when they tell me that they can't wait to try what I have taught them. Even better is when they later contact me and send me images of what they have produced. It gives me such a good feeling to know that I have helped someone." Ed cites Terry Martin as being a perfect example of who he would like to patter himself on; he does it all, from creation, to photography, to writing and curating. Ed had the good fortune to correspond with him and even was able to spend some time with him in the recent symposium in San Jose. "No doubt I will continue to turn to him for advice as I continue to shape my future," Ed says. Ed also hopes to concentrate more on photography as this has once again become one of his passions, thanks to the need to photograph his works: "As I have found the need to create some mood with my works in order to best represent them, I have begun to print and frame them. This has led to my concept that maybe the piece itself is not the final work of art, but the mounted and framed photograph is. This all relates back to painting with the subject of still lifes. It seems that photography has mostly ignored the concept of the still life image in recent years but I hope to start exploring this more with my works. Only one person can own the actual piece, but many would be able to own a framed print. I do believe this has potential for others as well. "€ Ed is passionate about how many fantastic turnings that he would love to have photos of on his wall. A powerful image does not only belong in magazines to be tucked away, but should be displayed on a wall, in his opinion: "Pieces take on an entirely different presence when they are shown at a scale different from their actual size. A dramatic photo of a 75mm Raffan pot blown up to large scale on a wall would be amazing, wouldn't it?" 1. You learn something from every piece, even those which you might not consider totally successful. Do not feel the need to complete a piece if you are not happy with it. I have had pieces that I have spent plenty of time on when I discovered it was not to my liking, but getting there taught me something else that I could use on a future work. Do not get discouraged, it is only wood and there is plenty more of it! 1. Whatâ€™s not to like about woodturning and all the great people involved with it?